Someone planning to evaluate or develop with the reader and required a power source to power the reader. Good for working on a lab bench. Provides an antenna, antenna cable, tags, and all miscellaneous cables, brackets in a carry case for one-stop-shop evaluation. Alien ALR-F800-ARG-DevC 4-port Enterprise PoE UHF RFID Reader Development Kit - 4-port Enterprise PoE reader, Gen 2, POE support, includes reader, both PoE injector and DC power supply, two ethernet cables, a USB cable, serial cable, one ALR-8697 antenna (with 20ft cable), tag sample packet, microSD card, VESA mounting bracket in black carry case with foam inserts. Quick Reference Guide, Quick Installation Guide, Software Developer's Kit (via FTP download). For use in Argentina. Alien ALR-F800-BRA-DevC 4-port Enterprise PoE UHF RFID Reader Development Kit - 4-port Enterprise PoE reader, Gen 2, POE support, includes reader, both PoE injector and DC power supply, two ethernet cables, a USB cable, serial cable, one ALR-8697 antenna (with 20ft cable), tag sample packet, microSD card, VESA mounting bracket in black carry case with foam inserts. Quick Reference Guide, Quick Installation Guide, Software Developer's Kit (via FTP download). For use in Brazil. Alien ALR-F800-CHN-DEV-C 4-port Enterprise PoE UHF RFID Reader Development Kit - 4-port Enterprise PoE reader, Gen 2, POE support. Includes reader, both PoE injector and DC power supply, two ethernet cables, a USB cable, serial cable, one ALR-8697 antenna (with 20ft cable), tag sample packet, microSD card, VESA mounting bracket in black carry case with foam inserts. Quick Reference Guide, Quick Installation Guide, Software Developer's Kit (via FTP download). For use in China. Alien ALR-F800-DEV-C 4-port Enterprise PoE UHF RFID Reader Development Kit - 4-port Enterprise PoE reader, Gen 2, POE support, includes reader, both PoE injector and DC power supply, two ethernet cables, a USB cable, serial cable, one ALR-8697 antenna (with 20ft cable), tag sample packet, microSD card, VESA mounting bracket in black carry case with foam inserts. Quick Reference Guide, Quick Installation Guide, Software Developer's Kit (via FTP download). Alien ALR-F800-EMA-DEV-C 4-port Enterprise PoE UHF RFID Reader Development Kit - 4-port Enterprise PoE reader, Gen 2, POE support, includes: reader, both PoE injector and DC power supply, two ethernet cables, a USB cable, serial cable, one ALR-8697 antenna (with 20ft cable), tag sample packet, microSD card, VESA mounting bracket in black carry case with foam inserts. Quick Reference Guide, Quick Installation Guide, Software Developer's Kit (via FTP download). For use in Europe, Middle East and Africa. Alien ALR-F800-ID-DEV-C 4-port Enterprise PoE UHF RFID Reader - 4-port Enterprise PoE reader, Gen 2, POE support, includes: reader, both PoE injector and DC power supply, two ethernet cables, a USB cable, serial cable, one ALR-8697 antenna (with 20ft cable), tag sample packet, microSD card, VESA mounting bracket in black carry case with foam inserts. Quick Reference Guide, Quick Installation Guide, Software Developer's Kit (via FTP download). For use in Indonesia. Alien ALR-F800-JP3-DEV-C 4-port Enterprise PoE UHF RFID Reader Development Kit - 4-port Enterprise PoE reader, Gen 2, POE support, includes: reader, both PoE injector and DC power supply, two ethernet cables, a USB cable, serial cable, one ALR-8697 antenna (with 20ft cable), tag sample packet, microSD card, VESA mounting bracket in black carry case with foam inserts. Quick Reference Guide, Quick Installation Guide, Software Developer's Kit (via FTP download). For use in Japan. Alien ALR-F800-KR2-DEV-C 4-port Enterprise PoE UHF RFID Reader Development Kit - 4-port Enterprise PoE reader, Gen 2, POE support, includes: reader, both PoE injector and DC power supply, two ethernet cables, a USB cable, serial cable, one ALR-8697 antenna (with 20ft cable), tag sample packet, microSD card, VESA mounting bracket in black carry case with foam inserts. Quick Reference Guide, Quick Installation Guide, Software Developer's Kit (via FTP download). For use in Korea. Alien ALR-F800-RSA-DEV-C 4-port Enterprise PoE UHF RFID Reader Development Kit - 4-port Enterprise PoE reader, Gen 2, POE support, includes: reader, both PoE injector and DC power supply, two ethernet cables, a USB cable, serial cable, one ALR-8697 antenna (with 20ft cable), tag sample packet, microSD card, VESA mounting bracket in black carry case with foam inserts. Quick Reference Guide, Quick Installation Guide, Software Developer's Kit (via FTP download). For use in Republic of South Africa. Alien ALR-F800-URY-DEV-C 4-port Enterprise PoE UHF RFID Reader Development Kit - 4-port Enterprise PoE reader, Gen 2, POE support, includes: reader, both PoE injector and DC power supply, two ethernet cables, a USB cable, serial cable, one ALR-8697 antenna (with 20ft cable), tag sample packet, microSD card, VESA mounting bracket in black carry case with foam inserts. Quick Reference Guide, Quick Installation Guide, Software Developer's Kit (via FTP download). For use in Uruguay and Peru. Alien ALR-F800-VN1-DEVC 4-port Enterprise PoE UHF RFID Reader Development Kit - 4-port Enterprise PoE reader, Gen 2, POE support, includes: reader, both PoE injector and DC power supply, two ethernet cables, a USB cable, serial cable, one ALR-8697 antenna (with 20ft cable), tag sample packet, microSD card, VESA mounting bracket in black carry case with foam inserts. Quick Reference Guide, Quick Installation Guide, Software Developer's Kit (via FTP download). For use in Vietnam. 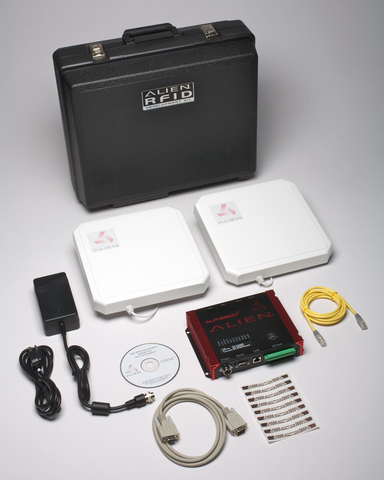 Alien ALR-F800-WR1-DEV-C 4-port Enterprise PoE UHF RFID Reader Development Kit - 4-port Enterprise PoE reader, Gen 2, POE support, includes: reader, both PoE injector and DC power supply, two ethernet cables, a USB cable, serial cable, one ALR-8697 antenna (with 20ft cable), tag sample packet, microSD card, VESA mounting bracket in black carry case with foam inserts. Quick Reference Guide, Quick Installation Guide, Software Developer's Kit (via FTP download). For use in Hong Kong and Australia.